Last Sunday, President Alberto Ruiz and Business Agent Nick Berry led UPS members in an informational meeting, exploring the final UPS offer and clarifying members’ questions. The discussion kicked off with a video from Teamsters Local 174’s Director of Communications and Research Jamie Fleming. In the video, Fleming delves into a financial analysis of the company, reviewing the competition of the company and the statistics that summarize the direction of their economic growth. The purpose of the video is to educate members on the development of the company and how we can best prepare for our future growth and retirement. 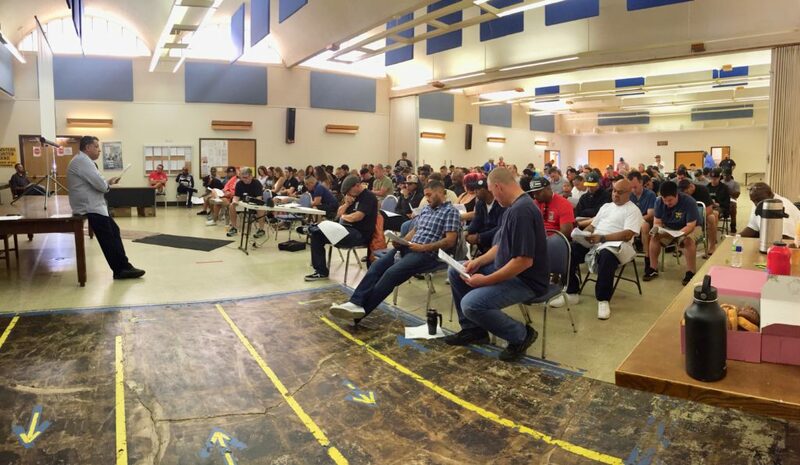 Both union officials explained both the National Master Agreement and the Northern California Supplemental Agreement step-by-step in its entirety, and then opened the floor for discussion. Many members passionately spoke up to confront contract updates they had found online. Some of the biggest game-changers for the contract include the newly introduced combination driver, protection against harassment, and excessive overtime. For complete information on the contract updates, visit UPS Rising. Lastly, they wrapped up the meeting, stating their support for the tentative agreements and encouraging members to educate themselves on the contract offer using legitimate sources that provide full details. Ruiz and Berry hosted the meeting to review the full and final offer, to create an open forum for members to ask any questions, and to debunk incorrect information that is currently circulating online. This week, Ruiz is currently examining the UPS Northern California Supplemental Agreement for its final review. Voting information will be mailed to all UPS members on how to cast your vote online. Listed below are the final contract proposals from UPS.